In this thrilling new series from Rysa Walker, the award-winning and best-selling author of Timebound, a teen psychic is the key to stopping a government conspiracy. It’s never wise to talk to strangers . . . and that goes double when they’re dead. Unfortunately, seventeen-year-old Anna Morgan has no choice. Resting on a park bench, touching the turnstile at the Metro station—she never knows where she’ll encounter a ghost. These mental hitchhikers are the reason Anna has been tossed from one foster home and psychiatric institution to the next for most of her life. Today we welcome Rysa for an interview! I always knew I wanted to be a writer, but I didn’t think it was a feasible career path for someone who grew up in the middle of nowhere and who had to incur a lot of school loans in order to attend college. So I took a more sensible career path and became a college professor, teaching history and government, and writing the occasional academic paper. But as much as I enjoyed teaching, it wasn’t really my passion, and I ended up writing fiction on the side, in what little spare time I had. 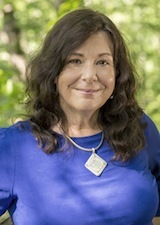 Luckily, my first novel, Timebound, won the Amazon Breakthrough Novel Award in 2013, and I was able to quit the day-job to focus on writing full-time. It varies. The CHRONOS Files theme (time travel) was probably inevitable, given that I’ve been a sci-fi fan since I was a little kid and since I taught history. 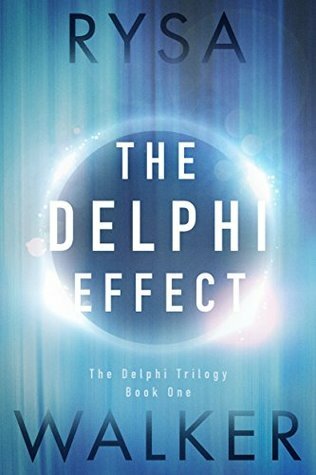 The Delphi Effect was directly inspired by a series of songs that popped up one after the other on my drive home from dropping the kids at school one morning, but the underlying themes--conspiracy theories, government secrets, and psychic phenomena--are interests I’ve had for years that wormed their way into the plot as I was writing. I do, but I rarely follow it. With each new book, I tell myself that I’m going to get more written earlier, and that I will force myself to write during the day. And then life happens. There are too many interruptions, tons of marketing tasks, and I’m really more of a nocturnal, deadline-driven creature than someone who can stick to a schedule. During that last four months before my deadline, I write pretty much “all night, every night.” I hit the bed around daylight and sleep until early afternoon, then I’m back at it. Very precariously during those four months when most of the writing gets done. My kids are teens now, and my husband works from home, so that helps. And we have the Chinese takeout place and Domino’s on speed dial. Tension, relatable characters, and concepts that make you think. I read many books that only have the first two, and I couldn’t tell you anything about them a week later other than that it was about shifters or witches or whatever. That’s fine, because often I just read to escape and to have something other than my own thoughts running through my head while I unload the dishwasher or run errands. But a great story line will add that last element -- a bigger-picture question that makes me think. Those are the books I remember long after I turn the final page. Oh, and romance. It doesn’t have to be the main theme of the book, but it’s the dash of spice that makes any story better. Writing the synopsis. It’s like trying to shove a giant marshmallow through a drinking straw without losing anything crucial. Same for blurbs and taglines. I dread that stage of the process. I’ve written four full-length novels -- the three books in The CHRONOS Files and The Delphi Effect, which is book one of The Delphi Trilogy. In addition, I’ve written three CHRONOS novellas and four CHRONOS short-stories. Favorite...hmmm. That’s tough. I’ll go with Timebound, since it’s the one that got the ball rolling and made it possible for me to quit teaching and write for a living. But I don’t think it’s necessarily the best written of my books. Hopefully, I’ve learned a bit more about the craft over the past few years. This is like asking a mom which kid is her favorite, so I’d have to give the question a resounding no! I even have warm feelings toward my villains, because I know their full story and understand why they do the things they do--stuff that frequently doesn’t make it to the reader. That’s one reason I like to write novellas and short stories from the villain’s perspective. After all, from the villain’s point of view, he or she is simply misunderstood and would be the hero of the story if the world wasn’t so naive. Most of my writing is done in my attic, aka the Writing Cave, although I’ve been known to write in coffee shops, in the van during soccer or piano practice, etc. This picture is actually not my Writing Cave, but I wish it was--assuming there’s coffee, chocolate, internet, an electrical outlet and a bathroom hidden somewhere in the background. I tried the traditional route of getting an agent for about a year after Timebound (originally entitled Time’s Twisted Arrow) was written. But I’m not exactly a patient person. I also expect professional courtesy, and agents are notorious for not even bothering to let you know whether they received the full manuscript they requested. I’m not sympathetic to the “we get so many” excuse, either -- I taught as many as 150 students a semester and I answered every email, at least briefly, because that was part of my job. At any rate, I opted to self-publish. It was going fairly well during the first six months, but I also entered the 2013 Amazon Breakthrough Novel Award, and to my great surprise and pleasure, won the grand prize. This meant the book got a new editor, a spiffy new cover, and a wonderful publisher, Skyscape. I was so happy with their work on Timebound and the other CHRONOS books that I didn’t even consider going elsewhere for The Delphi Trilogy. Also, Skyscape has been really cool about letting me self-publish the novellas in the series. That way, I can keep one foot in the indie world, which is great because I have lots of writer friends who are indie. My husband, sons, and my sister are generally my first readers. It was my sister, along with a close family friend, who encouraged me to self-publish rather than waiting around on a gatekeeper. I’m very glad I listened to them and took the plunge. Reading, of course. I also enjoy yoga, hanging with my family, and playing with Griffin, my excessively energetic golden retriever. Doing any of those at the beach makes it twice as fun. And I enjoy geeking out over Marvel movies, binge-watching shows like “Stranger Things,” and pretty much anything Star Trek or Princess Bride. I love the Ray Bradbury quote below because it emphasizes the two most important parts of writing, at least for me. The reading element is often overlooked. I’ve had people say they want to write fiction--they’ve even taken a few writing class--but they don’t really like reading. I have to struggle not shake them, because I strongly believe that you learn far more about writing from reading (and re-reading) books than you will ever learn from classes, no matter how skilled the instructor. Stephen King, although J.K. Rowling is a close second. Both of them have an enviable knack for characters that pulls me into pretty much every story they’ve ever written. A favorite book is harder...that’s often whatever book I’m reading right now. One that I go back to on a fairly regular basis is Watership Down, by Richard Adams--who, again, has such skill with characters that he was able to make me care deeply about the fate of a group of rabbits. The Stand is another, along with The Dark Tower series, that I revisit every few years. Aside from my family, I have a group of beta readers that I’ve assembled over the past few years who are an excellent sounding board. I usually add a few new beta buddies with each book, hoping to get a fresh perspective, so it’s getting to be a rather large group. And I couldn’t get by without the advice of my editorial team at Skyscape, especially my managing editor, Courtney Miller. I’m currently working on The Delphi Deception, which is the next book in the Delphi Trilogy. And there’s a novella currently bubbling away in the back of my head that I’ll be writing as soon as I submit the draft for Deception to my editor. Intolerance, racism, willful ignorance, bullying, child or animal abuse. Ireland, although I’d also love to take another trip to Turkey. I was in Istanbul once on business and work took up so much of my time that I had just a single day to see the sights before heading home. An hour at the Hagia Sophia, an hour at Topkapi Palace, a few minutes at the Grand Bazaar...it wasn’t nearly enough to do that beautiful city justice. Thanks so much for stopping by today, Rysa. It was great having you with us!